Staghead Designs Home | About Us | Opportunities | Sponsorships | Contact Us! This week I feel privileged to introduce Brad and Liz, the founders of Staghead Designs. 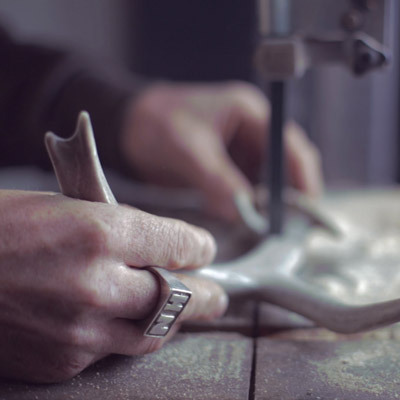 Brad and Liz create beautifully crafted rings made from sustainably sourced products. Please check out the Staghead design youtube clip where the full crafting process shows Brad’s passion for each ring he produces. Brad and Liz use the proceeds from the sale of their products to conduct humanitarian trips helping underprivileged children throughout the world. It is rare to find such a talented artesian and philanthropist. What started you in creating and designing the various pieces Staghead Designs offers? 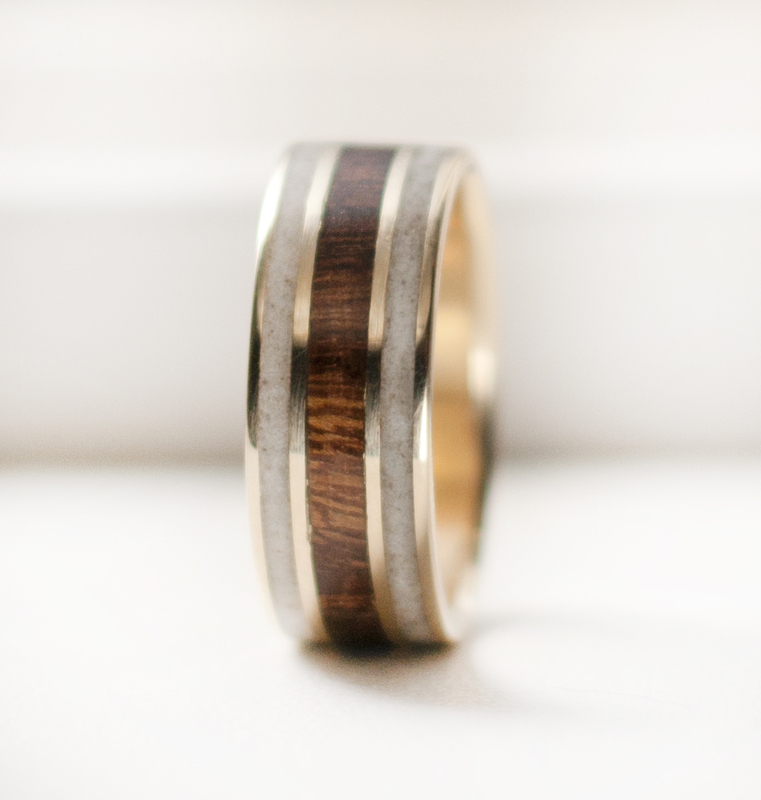 My wife Liz and I have always considered ourselves to be makers, so when we found the current offering of wedding bands lacking in uniqueness and character, we decided to create our own. Soon after that, while hiking near our home we found some deer antler sheds, which Liz asked me to make a ring from. The final result was beautiful and helped symbolize our relationship and love perfectly. From that ring, which was made as an experiment from a desire for uniqueness, came a new hobby and trait which quickly evolved into our live’s work, as we discovered an overwhelming demand from couples who also wanted a unique and personal way to symbolize their love and commitment. One of our earliest and most popular designs “The Banner”, was designed for and named after one our close friends. 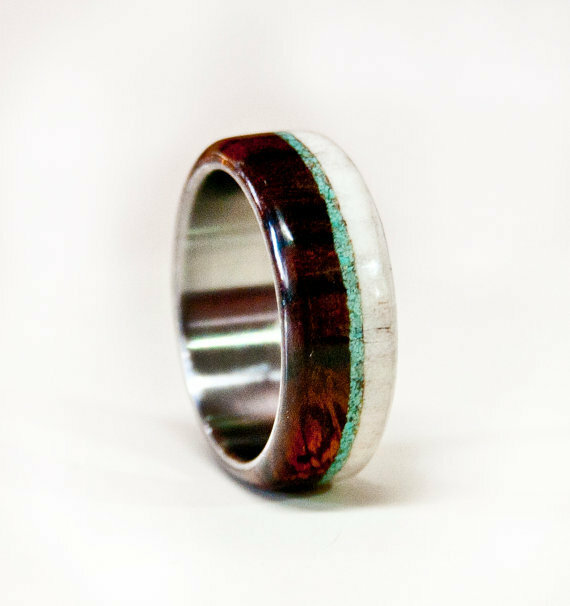 It is made with Desert Ironwood, and antler with and off center turquoise inlay, generally set on titanium. The Element is a design that was an instant favorite on our site. 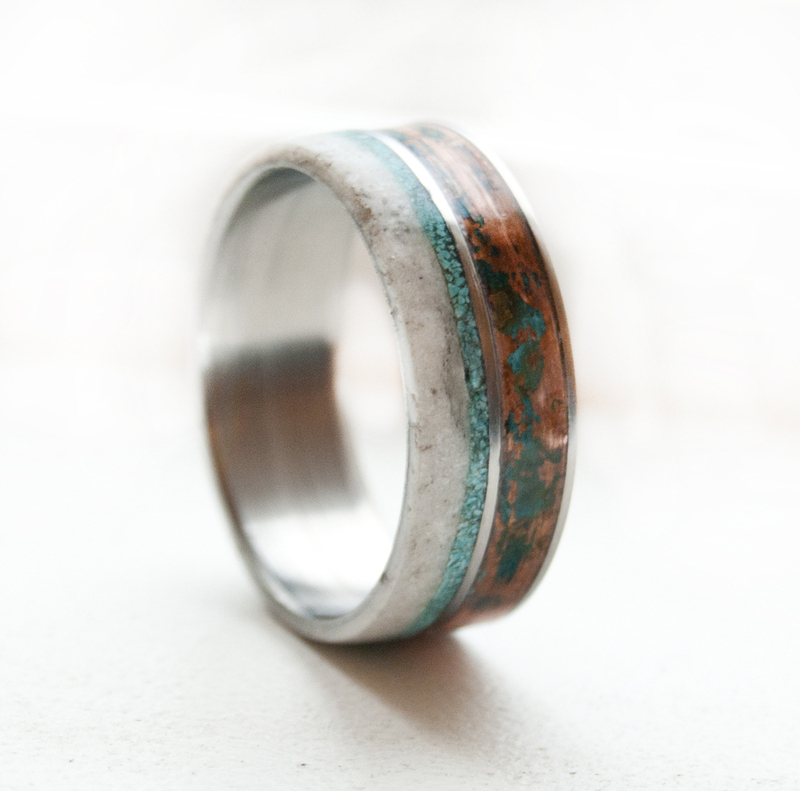 It is also based in titanium, with channel inlays of antler, turqouis, and patina copper. Our personal favorite is this new design set in 10k gold, with two antler channels on either side of the center channel which contains Dessert Ironwood. Why do you think that handmade items are a great option for men? Why should guys support handmade? Why should people buy handmade for the men they love? We believe that handmade options give men an opportunity to support and appreciate the core virtues of manliness. Handmade item are one of a kind and say something about who you are and what you stand for. Each item that is made by hand helps to provide its maker with meaningful employment and the opportunity to create. In our case and the case of many others, handmade items generally represent the effort to make something that is better or more suited for the needs of an individual, than what is currently available. What are your plans for Staghead Designs? Any news or sneak peeks at things our readers can look for in coming months? Due to our rapid growth we have recently taken on new team members to help us fulfill our orders more quickly, and allow us to expand into new product lines. Look for us to expand our reach into other menswear such as cuff links, and tie bars. 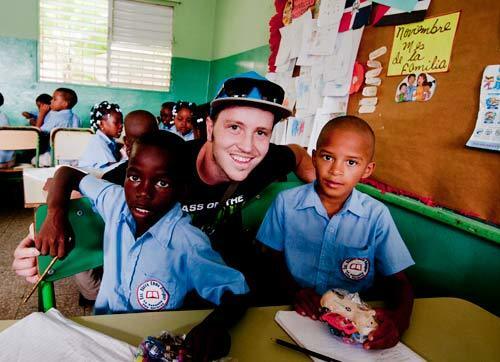 In 2013 Brad joined a humanitarian effort in The Dominican Republic where he spent his time driving across the island visiting local kids. He has stated that the experiences moved him and changed his perspective on life. Brad was blessed by the experience of leaving their day to day lives to support a charity that offers sporting goods to underprivileged children. Since this experience Brad and Liz donate a portion of every ring sale to an annual humanitarian adventure and considers this their responsibility to look after others. I would like to figure out a price on your Dessert ironwood design. I am about to pop the question to my girlfriend and I definitely already know her answer. I would like to send in antlers from the first deer I ever shot. I was also wondering if it were at all possible to include a small diamond in the ring. One that doesn’t stick out but is relatively flat with the rest of the ring. I was also wondering if the metal could be all gold. My email is a good way to get a hold of me. Thanks for your time.